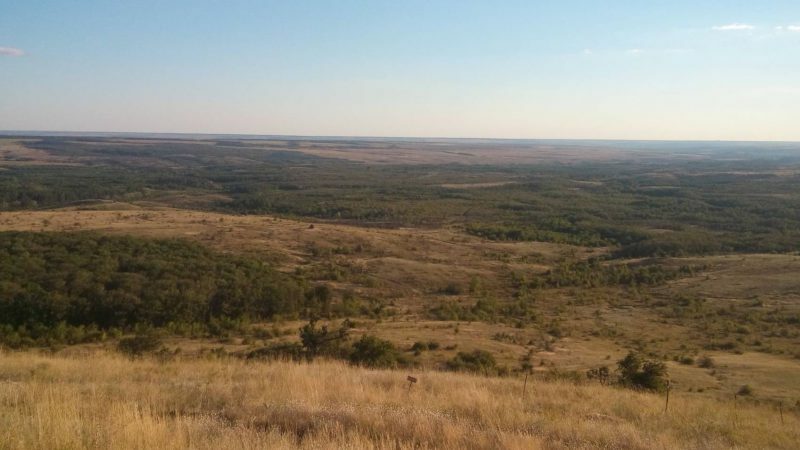 View from Saur Mogila. DPR. About 20 thousand people gathered for the rally commemorating the Victory Day at the legendary tumulus of Saur Mogila in the Donetsk region on May 8, Donetsk News Agency reported on its website. The people honored the memory of the fallen during the Great Patriotic War and the conflict in Donbass with a moment of silence. Aleksandr Zakharchenko, head of the DPR, gave a speech at the rally. He stressed the importance of tomorrow’s holiday, the eternity of heroic deeds of soldiers, who fell in the combat for the tumulus. “Donbass is unconquerable!,” head of the DPR concluded his speech. Intense fighting for the Saur Mogila height unfolded between the Red Army troops and Nazi Germany forces in July and August 1943. The height was taken and retaken by both forces several times, but on September 1st, 1943, the Soviet troops took it under their full control. In 1967, the memorial was built to commemorate the memory of those who were killed during those battles. In summer 2014, the memorial was seriously damaged during multiple attempts of the Ukrainian troops to dislodge the DPR forces from the height during the conflict that unfloded in Donbass. This entry was posted in News from Ukraine and tagged Abroad: The Real World, DPR, Victory Day over Nazi Germany. Bookmark the permalink.